The lead programmer behind Click Here Designs built the company from a bedroom closet beginning in 1997. Prior to building Click Here Designs, Michael worked with state government maintaining networks and server side information technology as well as working with the most under severed clients. 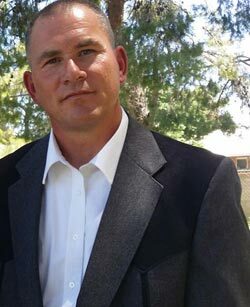 He received his degree in Human Services from the Salish Kootenai College, a tribally organized four year college on the Flathead Indian Reservation in 1994 after being raised under the supervision of department of family services in the foster care system. Michael believes the human aspect is the most important element of technology. "There are lots of companies that will build a website for your business, but very few that will take the time to understand the human aspect of your business". "We are talking about people... connecting people with other people to develop positive long lasting relationships". Click Here Designs wasn't created to be as big as the no name well branded website creation companies that herd folks like cattle selling them products they don't need in order to increase their own bottom line, there are no shortage of them. Nor are we in the business to forget clients names and ask their customer number before we can serve them. Click Here Designs doesn't compete on that level. All businesses are involved in sales, and sales is plural. A company isn't built on a single sale. A company is built on many sales, and many sales come from connecting with and understanding people. Michael's upbringing in foster case and first hand realization of government's parenting soured him towards connecting with people. It wasn't until a handful of people showed him first hand that it is the people that matter, not the products, not the things. Spending four years at a tribally operated college cemented that grounding and started Michael on the journey of rebuilding connections lost along the way. "As I developed into a programmer I realized that computers were easy, it was emotional connections with people that were hard for to me understand, so I spent my focus there, on understanding people and their connections with technology and other people". Click Here Designs has been built on the idea that anyone, and most everyone can provide information technology services. This is not our way of doing business, our philosophy, the philosophy that allowed Click Here Designs to flourish is the time taken to understand and develop relationships with people understanding their needs and creating dynamic and robust website service to meet those needs. This philosophy is not for everyone, some folks like self checkout, and we can provide them with do it yourself website serves as well. Our focus, and our bread and butter business is connecting and helping businesses achieve their online goals. "Much has changed in computing over the last 20 years, and no doubt much will change in the next 20 years, but I believe that connecting with people, understanding and focusing on their needs is the most important aspect of any business". Connect with Michael at 406-883-6237 or contact him through this website here.